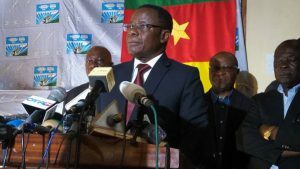 Maurice Kamto, one of the eight opposition candidates for the October 7 presidential election, has in a press conference declared victory, a day after the election exercise took place in the highly contested race. In the afternoon of October 8, the candidate of the Cameroon Renaissance movement, CRM, addressed the press corps in the nation’s capital, Yaounde, alongside supporters, saying, “My mission was to take a penalty. I did and I scored…” Kamto declared amidst chants from supporters. Kamto in his press outing, also called on the incumbent President, Paul Biya, to organise a peaceful handover of power in the interest of the country, and also to avoid post electoral violence. He went on to declare that he will ensure the safety of President Paul Biya’s family, when he effectively takes over. He urged the forces of law and order, to ensure the peaceful transfer of power from the present administration to the next. Making reference to those affected by the crisis in the Anglophone regions, Kamto said, he was coming to their aid, and will ensure the reconstruction and compensation of those affected by the crisis that has crippled life in the two regions. “I only have a word and I will abide by it, I am coming soon to reconcile our nation as a family. I am committed to rebuilding the villages that have been burnt down, to compensate the incurred losses. Don’t lose hope, very soon, the sun will rise again over the Northwest and Southwest” He ended. The declaration of Maurice Kamto, come during a controversial period in the political life of Cameroon, as many fear that the wide range of time, 15days, provided by the law, after which the results would be declared, may give room for election malpractice that could greatly compromise the verdict of the ballot. The Minister of Territorial Administration, Paul Atanga Nji, had in a press outing, declared that only the Constitutional Council have the mandate to declare election results and that as such, anyone declaring the results will be punished by the laws in place. On his part, Cameroon’s Communication Minister, Issa Tchiroma, who himself had declared the Victory of the incumbent President Paul Biya, prior to the elcection, faulted the CRM for declaring victory for Maurice Kamto. Many predict that the results that will be presented by the Constitutional Council in the days ahead may be highly contested given the atmosphere that is fast picking steam. I simply want to say I am just new to weblog and really loved you’re web blog. Almost certainly I’m going to bookmark your blog post . You absolutely have outstanding articles and reviews. Bless you for sharing your blog. whoah this blog is excellent i like studying your articles. Keep up the great work! You recognize, a lot of people are looking round for this information, you can help them greatly. where to buy viagra london order viagra online cheap will viagra show up in blood test. Thank you, I’ve recently been searching for info approximately this topic for ages and yours is the greatest I have discovered till now. However, what in regards to the bottom line? Are you sure concerning the source? I as well as my buddies were actually reviewing the excellent guides on your site then unexpectedly I had a horrible suspicion I never thanked the blog owner for them. All of the young boys happened to be absolutely glad to read them and already have quite simply been using them. Thanks for simply being simply kind and then for using some notable information most people are really wanting to understand about. Our own honest apologies for not expressing gratitude to sooner. I would like to thnkx for the efforts you’ve put in writing this site. I’m hoping the same high-grade web site post from you in the upcoming as well. Actually your creative writing abilities has inspired me to get my own web site now. Really the blogging is spreading its wings quickly. Your write up is a good example of it. Thanks for every other informative site. The place else may I get that kind of info written in such an ideal approach? I have a project that I am just now working on, and I have been at the glance out for such information. My spouse and i have been very glad Ervin managed to do his studies using the ideas he got through your weblog. It is now and again perplexing just to be offering ideas which usually some other people might have been making money from. We discover we’ve got the website owner to appreciate for that. Most of the illustrations you have made, the easy site navigation, the relationships you will help to engender – it’s got everything powerful, and it’s helping our son in addition to our family consider that this situation is thrilling, which is extraordinarily indispensable. Many thanks for all the pieces! I¡¦m not sure where you are getting your information, but good topic. I needs to spend a while studying more or understanding more. Thanks for excellent information I was looking for this info for my mission. My spouse and i got comfortable that Raymond could conclude his basic research through your ideas he discovered from your web pages. It is now and again perplexing to simply continually be making a gift of guidance that many some other people might have been trying to sell. And now we realize we now have the blog owner to give thanks to for this. All the explanations you have made, the simple site navigation, the friendships you aid to foster – it’s many fabulous, and it’s aiding our son and our family consider that the issue is cool, which is certainly particularly fundamental. Many thanks for all! are cialis pills[/url] sta je bolje levitra ili tadalafil. Hello, Neat post. There’s an issue along with your website in web explorer, might test this¡K IE nonetheless is the market chief and a big component of other people will omit your great writing because of this problem. I in addition to my friends have already been digesting the excellent techniques from your site and so at once came up with a terrible feeling I had not thanked the web site owner for those tips. Most of the young boys came absolutely thrilled to read all of them and have quite simply been tapping into those things. Appreciate your indeed being considerably helpful and then for picking out certain quality themes millions of individuals are really needing to discover. My personal sincere regret for not saying thanks to earlier. Whats Taking place i’m new to this, I stumbled upon this I have found It absolutely useful and it has helped me out loads. I hope to contribute & assist different customers like its aided me. Good job. Hello my family member! I wish to say that this article is awesome, great written and come with approximately all vital infos. I¡¦d like to peer more posts like this . I¡¦ll immediately grasp your rss as I can’t find your e-mail subscription hyperlink or newsletter service. Do you’ve any? Please permit me realize in order that I could subscribe. Thanks. I was just searching for this information for a while. After 6 hours of continuous Googleing, finally I got it in your web site. I wonder what’s the lack of Google strategy that do not rank this type of informative web sites in top of the list. Generally the top sites are full of garbage. I do agree with all the concepts you have offered to your post. They are really convincing and will definitely work. Still, the posts are too short for novices. May just you please lengthen them a bit from subsequent time? Thanks for the post. I just want to say I am just all new to blogging and site-building and certainly liked this blog. Very likely I’m going to bookmark your blog post . You really have beneficial stories. Cheers for sharing your web page. Thanks for some other magnificent article. The place else could anyone get that type of information in such a perfect way of writing? I’ve a presentation next week, and I’m on the search for such information. Hi there, I discovered your blog by way of Google at the same time as looking for a similar topic, your web site got here up, it seems good. I’ve bookmarked it in my google bookmarks. Thanks a bunch for sharing this with all of us you actually recognize what you’re talking approximately! Bookmarked. Please additionally talk over with my web site =). We will have a hyperlink alternate arrangement among us! What i do not realize is in fact how you are no longer really much more neatly-appreciated than you may be right now. You are so intelligent. You realize thus significantly in terms of this matter, produced me in my opinion consider it from so many numerous angles. Its like women and men aren’t interested until it is something to accomplish with Woman gaga! Your own stuffs outstanding. At all times maintain it up! I’ve been browsing on-line more than three hours these days, but I by no means found any interesting article like yours. It¡¦s beautiful value sufficient for me. In my opinion, if all web owners and bloggers made excellent content material as you probably did, the net shall be much more helpful than ever before. Fantastic goods from you, man. I’ve understand your stuff previous to and you are just extremely great. I really like what you have acquired here, certainly like what you’re stating and the way in which you say it. You make it enjoyable and you still take care of to keep it sensible. I can not wait to read much more from you. This is actually a great website. I must convey my admiration for your generosity supporting men who absolutely need help with this one issue. Your very own dedication to passing the solution along ended up being extremely invaluable and has consistently enabled men and women much like me to realize their pursuits. This invaluable facts means a great deal a person like me and extremely more to my colleagues. Thank you; from each one of us. Thanks so much for providing individuals with such a remarkable possiblity to read in detail from this website. It is often so pleasant plus packed with amusement for me personally and my office friends to search your blog a minimum of thrice in 7 days to find out the newest stuff you have got. Of course, I am at all times astounded for the eye-popping principles served by you. Some two ideas on this page are easily the most efficient I’ve had. What i do not realize is if truth be told how you are no longer really a lot more smartly-favored than you might be now. You are very intelligent. You realize therefore considerably in terms of this topic, produced me in my view consider it from a lot of various angles. Its like men and women don’t seem to be interested unless it¡¦s one thing to accomplish with Girl gaga! Your individual stuffs outstanding. At all times deal with it up! Thank you for sharing excellent informations. Your site is very cool. I am impressed by the details that you have on this blog. It reveals how nicely you understand this subject. Bookmarked this web page, will come back for more articles. You, my friend, ROCK! I found simply the info I already searched everywhere and just couldn’t come across. What an ideal website. Hi, Neat post. There is an issue along with your site in web explorer, might test this¡K IE still is the marketplace leader and a good part of folks will omit your fantastic writing due to this problem. Thank you, I’ve recently been looking for information about this topic for a while and yours is the greatest I have came upon till now. But, what concerning the bottom line? Are you sure about the supply? Hello there. I discovered your blog via Google while looking for a related subject, your website got here up. It seems great. I have bookmarked it in my google bookmarks to visit then. I must show thanks to this writer just for bailing me out of this type of matter. Just after researching through the world-wide-web and coming across techniques which were not helpful, I believed my entire life was gone. Existing devoid of the solutions to the difficulties you’ve solved all through the short article is a critical case, and those which may have in a negative way affected my entire career if I hadn’t discovered the website. Your personal knowledge and kindness in maneuvering a lot of stuff was vital. I am not sure what I would’ve done if I had not come upon such a solution like this. I can also at this point look forward to my future. Thanks a lot very much for the professional and result oriented guide. I won’t think twice to endorse your web site to any individual who requires guidelines about this subject. Simply want to say your article is as astounding. The clearness in your post is simply nice and i can assume you’re an expert on this subject. Fine with your permission allow me to grab your feed to keep updated with forthcoming post. Thanks a million and please keep up the enjoyable work. Hello there. I found your website by way of Google whilst looking for a related subject, your site came up. It appears to be great. I’ve bookmarked it in my google bookmarks to come back then. I’m writing to make you be aware of what a outstanding discovery my wife’s princess experienced reading through your web site. She mastered several details, which included how it is like to possess an incredible teaching character to make the rest completely completely grasp specified complex subject areas. You actually surpassed my desires. Thanks for presenting these insightful, healthy, edifying as well as fun thoughts on this topic to Mary. I¡¦ve read a few good stuff here. Definitely price bookmarking for revisiting. I wonder how so much effort you put to create any such excellent informative site. Hello there. I discovered your web site via Google at the same time as searching for a comparable matter, your site got here up. It seems to be great. I’ve bookmarked it in my google bookmarks to come back then. Hi there. I discovered your website by way of Google at the same time as searching for a similar subject, your website came up. It seems great. I have bookmarked it in my google bookmarks to visit then. Hiya, I’m really glad I’ve found this info. Nowadays bloggers publish only about gossip and web stuff and this is really frustrating. A good site with interesting content, that’s what I need. Thank you for making this web-site, and I’ll be visiting again. Do you do newsletters by email? Hi there. I discovered your blog by way of Google while looking for a related subject, your site got here up. It seems good. I’ve bookmarked it in my google bookmarks to come back then. I was just looking for this information for some time. After six hours of continuous Googleing, finally I got it in your website. I wonder what’s the lack of Google strategy that do not rank this kind of informative sites in top of the list. Generally the top sites are full of garbage. What i don’t realize is actually how you’re not actually a lot more smartly-liked than you may be right now. You’re very intelligent. You understand thus considerably in terms of this subject, produced me individually consider it from so many numerous angles. Its like women and men don’t seem to be interested unless it is something to do with Lady gaga! Your own stuffs nice. At all times deal with it up! Hey there. I discovered your website via Google while searching for a related matter, your website got here up. It looks good. I have bookmarked it in my google bookmarks to come back then. Hi there. I discovered your site by way of Google at the same time as searching for a similar topic, your website got here up. It appears to be good. I have bookmarked it in my google bookmarks to come back then. Hiya, I am really glad I’ve found this information. Nowadays bloggers publish only about gossip and web stuff and this is really annoying. A good blog with exciting content, this is what I need. Thanks for making this website, and I will be visiting again. Do you do newsletters by email? Hey there. I found your web site by the use of Google at the same time as looking for a related subject, your site came up. It appears to be good. I’ve bookmarked it in my google bookmarks to visit then. Hello there. I found your blog by way of Google while looking for a related matter, your site got here up. It seems good. I have bookmarked it in my google bookmarks to come back then. I will right away grasp your rss feed as I can’t to find your email subscription link or e-newsletter service. Do you have any? Kindly allow me recognize so that I may subscribe. Thanks. I and also my buddies have already been reviewing the best secrets and techniques found on your website and then then came up with an awful suspicion I had not thanked the web blog owner for those secrets. All of the young men are already so warmed to read them and already have definitely been making the most of these things. We appreciate you being well thoughtful and for opting for varieties of fantastic useful guides most people are really desirous to be aware of. Our own honest apologies for not expressing gratitude to you earlier. Normally I do not read article on blogs, however I would like to say that this write-up very compelled me to check out and do so! Your writing style has been amazed me. Thank you, quite nice post. My spouse and i ended up being more than happy John could conclude his research using the precious recommendations he came across out of your blog. It’s not at all simplistic to just continually be freely giving instructions which a number of people might have been selling. And we grasp we now have the writer to be grateful to for that. The entire illustrations you’ve made, the simple blog navigation, the friendships your site aid to instill – it’s got everything great, and it’s assisting our son in addition to the family understand the article is pleasurable, which is extremely mandatory. Thank you for everything! Hey there. I found your web site by the use of Google at the same time as looking for a similar topic, your website came up. It seems to be great. I’ve bookmarked it in my google bookmarks to visit then. Hello there. I found your site via Google whilst searching for a related matter, your web site came up. It appears great. I’ve bookmarked it in my google bookmarks to visit then. Hello there. I found your site by way of Google while looking for a similar subject, your web site got here up. It looks good. I’ve bookmarked it in my google bookmarks to visit then. Hi there. I discovered your website by means of Google while looking for a comparable topic, your website came up. It seems great. I’ve bookmarked it in my google bookmarks to visit then. Hiya, I am really glad I have found this info. Nowadays bloggers publish only about gossip and web stuff and this is actually annoying. A good website with interesting content, that’s what I need. Thanks for making this site, and I’ll be visiting again. Do you do newsletters by email? Hiya, I am really glad I’ve found this info. Nowadays bloggers publish just about gossip and internet stuff and this is really frustrating. A good website with interesting content, that is what I need. Thanks for making this web site, and I’ll be visiting again. Do you do newsletters by email? Thank you for sharing superb informations. Your site is so cool. I’m impressed by the details that you have on this site. It reveals how nicely you understand this subject. Bookmarked this website page, will come back for extra articles. You, my friend, ROCK! I found just the information I already searched everywhere and just couldn’t come across. What a great web-site. Hello there. I discovered your website via Google while looking for a related topic, your web site got here up. It appears good. I’ve bookmarked it in my google bookmarks to come back then. I do agree with all the concepts you’ve offered in your post. They are really convincing and can certainly work. Nonetheless, the posts are too short for beginners. May you please extend them a bit from subsequent time? Thank you for the post. Hey there. I discovered your site by means of Google whilst searching for a related topic, your website came up. It seems great. I’ve bookmarked it in my google bookmarks to visit then. Hey there. I found your blog by means of Google while searching for a comparable subject, your web site got here up. It appears great. I have bookmarked it in my google bookmarks to visit then. Hey there. I found your website by means of Google even as looking for a similar topic, your web site got here up. It looks great. I’ve bookmarked it in my google bookmarks to come back then. I simply wanted to jot down a word to appreciate you for all the splendid ways you are placing on this website. My particularly long internet search has finally been recognized with beneficial tips to write about with my company. I ‘d point out that we site visitors actually are undeniably fortunate to dwell in a fantastic network with many marvellous individuals with helpful guidelines. I feel somewhat blessed to have discovered your webpages and look forward to some more fabulous times reading here. Thanks a lot again for a lot of things. I am only commenting to make you understand what a incredible experience our daughter developed browsing yuor web blog. She came to understand a good number of issues, with the inclusion of what it’s like to possess a great teaching spirit to let other individuals effortlessly understand several specialized topics. You actually did more than my expected results. I appreciate you for producing those beneficial, trusted, informative and in addition cool tips about that topic to Tanya. I’m just commenting to make you be aware of what a notable discovery my wife’s princess found viewing your site. She learned several issues, not to mention how it is like to possess a marvelous helping spirit to make a number of people without problems learn about a number of problematic topics. You truly surpassed our expectations. Thanks for rendering these necessary, safe, informative and also cool tips on that topic to Jane. Hi there. I discovered your web site via Google whilst looking for a comparable topic, your web site got here up. It appears good. I’ve bookmarked it in my google bookmarks to come back then. Hi there. I found your website by the use of Google even as searching for a related matter, your website got here up. It looks great. I have bookmarked it in my google bookmarks to come back then. Hey there. I found your blog by means of Google while looking for a related matter, your website came up. It seems good. I’ve bookmarked it in my google bookmarks to visit then. Hey there. I discovered your website by way of Google while searching for a similar subject, your website came up. It appears to be great. I have bookmarked it in my google bookmarks to visit then. I was just looking for this info for some time. After 6 hours of continuous Googleing, finally I got it in your website. I wonder what is the lack of Google strategy that do not rank this kind of informative web sites in top of the list. Normally the top web sites are full of garbage. Hey there. I found your blog via Google at the same time as searching for a similar matter, your site came up. It appears to be great. I’ve bookmarked it in my google bookmarks to come back then. What i don’t understood is in reality how you’re not actually much more neatly-favored than you may be now. You’re very intelligent. You already know thus significantly when it comes to this topic, produced me for my part consider it from a lot of numerous angles. Its like men and women are not interested until it¡¦s one thing to accomplish with Girl gaga! Your own stuffs nice. All the time deal with it up! Hey very cool site!! Guy .. Beautiful .. Superb .. I will bookmark your blog and take the feeds additionally¡KI am glad to find so many helpful info right here in the publish, we need develop more techniques on this regard, thanks for sharing. . . . . . I do believe all of the ideas you have offered to your post. They are very convincing and will certainly work. Nonetheless, the posts are too short for starters. Could you please prolong them a bit from subsequent time? Thank you for the post. I was just searching for this information for some time. After six hours of continuous Googleing, at last I got it in your site. I wonder what is the lack of Google strategy that do not rank this type of informative web sites in top of the list. Usually the top web sites are full of garbage. Hiya, I’m really glad I’ve found this info. Today bloggers publish only about gossip and web stuff and this is really frustrating. A good site with interesting content, that’s what I need. Thanks for making this website, and I’ll be visiting again. Do you do newsletters by email? Hey there. I found your web site by the use of Google whilst looking for a related topic, your website got here up. It looks great. I have bookmarked it in my google bookmarks to come back then. Hey there. I found your site via Google while looking for a similar matter, your web site came up. It appears great. I’ve bookmarked it in my google bookmarks to come back then. Hiya, I’m really glad I’ve found this info. Nowadays bloggers publish just about gossip and net stuff and this is really frustrating. A good web site with interesting content, this is what I need. Thanks for making this web-site, and I’ll be visiting again. Do you do newsletters by email? Hello there. I discovered your web site by way of Google while searching for a similar matter, your website got here up. It seems good. I’ve bookmarked it in my google bookmarks to come back then. Hi there. I found your website by the use of Google whilst looking for a related matter, your website got here up. It looks good. I have bookmarked it in my google bookmarks to visit then. Hey there. I discovered your blog by the use of Google even as searching for a similar subject, your website came up. It seems great. I’ve bookmarked it in my google bookmarks to come back then. Hiya, I am really glad I’ve found this info. Nowadays bloggers publish just about gossip and internet stuff and this is really frustrating. A good web site with interesting content, that’s what I need. Thank you for making this site, and I’ll be visiting again. Do you do newsletters by email? Hello there. I found your blog by means of Google at the same time as looking for a similar matter, your site came up. It appears to be great. I’ve bookmarked it in my google bookmarks to visit then. Hiya, I am really glad I’ve found this info. Nowadays bloggers publish only about gossip and web stuff and this is really frustrating. A good blog with interesting content, this is what I need. Thank you for making this website, and I’ll be visiting again. Do you do newsletters by email? Hiya, I am really glad I’ve found this information. Today bloggers publish just about gossip and web stuff and this is actually annoying. A good web site with interesting content, that’s what I need. Thank you for making this web-site, and I will be visiting again. Do you do newsletters by email? hello there and thank you for your information – I have certainly picked up something new from right here. I did however expertise some technical points using this website, as I experienced to reload the website many times previous to I could get it to load properly. I had been wondering if your web host is OK? Not that I’m complaining, but sluggish loading instances times will sometimes affect your placement in google and can damage your high quality score if advertising and marketing with Adwords. Anyway I am adding this RSS to my e-mail and can look out for much more of your respective exciting content. Ensure that you update this again very soon..
Hey there. I found your website by way of Google at the same time as looking for a related matter, your website got here up. It seems to be good. I’ve bookmarked it in my google bookmarks to come back then. Hello there. I discovered your blog by way of Google while searching for a related topic, your website got here up. It seems to be great. I’ve bookmarked it in my google bookmarks to visit then. Hello there. I found your website by means of Google whilst looking for a comparable matter, your site got here up. It looks good. I have bookmarked it in my google bookmarks to come back then. Excellent goods from you, man. I have understand your stuff previous to and you’re just extremely wonderful. I really like what you’ve acquired here, certainly like what you are saying and the way in which you say it. You make it enjoyable and you still take care of to keep it smart. I can not wait to read much more from you. This is actually a terrific site. You really make it appear really easy together with your presentation however I to find this topic to be really something that I think I might never understand. It kind of feels too complex and extremely huge for me. I’m looking forward for your next post, I will attempt to get the grasp of it! Hi there. I discovered your website via Google while looking for a similar topic, your website got here up. It appears good. I have bookmarked it in my google bookmarks to come back then. Hi there. I discovered your site by way of Google even as searching for a comparable topic, your site came up. It seems good. I have bookmarked it in my google bookmarks to visit then. Hey there. I found your blog by the use of Google at the same time as looking for a related subject, your site got here up. It seems to be good. I have bookmarked it in my google bookmarks to visit then. Hiya, I am really glad I’ve found this information. Today bloggers publish just about gossip and internet stuff and this is really annoying. A good website with interesting content, this is what I need. Thank you for making this website, and I will be visiting again. Do you do newsletters by email? Hiya, I am really glad I have found this info. Today bloggers publish just about gossip and net stuff and this is really frustrating. A good web site with exciting content, that is what I need. Thank you for making this web-site, and I’ll be visiting again. Do you do newsletters by email? Hey there. I discovered your blog by means of Google whilst searching for a related subject, your web site came up. It appears good. I have bookmarked it in my google bookmarks to visit then. Hello there. I found your site by means of Google at the same time as looking for a comparable matter, your website got here up. It appears to be great. I have bookmarked it in my google bookmarks to come back then. Hey there. I discovered your web site by means of Google even as looking for a similar subject, your website came up. It appears good. I have bookmarked it in my google bookmarks to come back then. Hiya, I’m really glad I’ve found this info. Nowadays bloggers publish only about gossip and web stuff and this is really irritating. A good web site with interesting content, this is what I need. Thanks for making this website, and I will be visiting again. Do you do newsletters by email? Hiya, I am really glad I’ve found this information. Today bloggers publish just about gossip and net stuff and this is actually frustrating. A good blog with interesting content, this is what I need. Thanks for making this website, and I’ll be visiting again. Do you do newsletters by email? Hello there. I found your website by way of Google while looking for a comparable topic, your website came up. It seems to be good. I’ve bookmarked it in my google bookmarks to visit then. Hiya, I’m really glad I’ve found this information. Today bloggers publish only about gossip and internet stuff and this is really annoying. A good site with exciting content, that is what I need. Thank you for making this website, and I will be visiting again. Do you do newsletters by email? Hey there. I found your blog via Google while searching for a comparable subject, your website got here up. It seems to be great. I’ve bookmarked it in my google bookmarks to visit then. Hello there. I discovered your site by means of Google even as looking for a related topic, your site got here up. It appears great. I’ve bookmarked it in my google bookmarks to visit then. Hey there. I discovered your blog by means of Google at the same time as looking for a similar topic, your web site got here up. It seems to be good. I have bookmarked it in my google bookmarks to come back then. Hi there. I discovered your website by means of Google while looking for a related topic, your site came up. It looks great. I have bookmarked it in my google bookmarks to come back then. Hey there. I found your blog by way of Google even as looking for a similar topic, your web site came up. It seems good. I’ve bookmarked it in my google bookmarks to come back then. Hiya, I am really glad I have found this information. Today bloggers publish only about gossip and web stuff and this is really irritating. A good site with interesting content, this is what I need. Thank you for making this site, and I’ll be visiting again. Do you do newsletters by email? Hiya, I am really glad I’ve found this information. Today bloggers publish just about gossip and internet stuff and this is actually annoying. A good blog with exciting content, that’s what I need. Thanks for making this web site, and I’ll be visiting again. Do you do newsletters by email? Hey there. I discovered your web site by the use of Google while looking for a related matter, your web site got here up. It appears to be great. I’ve bookmarked it in my google bookmarks to come back then. I would like to thank you for the efforts you have put in writing this blog. I’m hoping the same high-grade web site post from you in the upcoming also. In fact your creative writing abilities has encouraged me to get my own web site now. Actually the blogging is spreading its wings rapidly. Your write up is a good example of it. Thanks for another informative website. The place else may I get that kind of information written in such a perfect means? I’ve a undertaking that I am just now working on, and I’ve been on the glance out for such information. Thanks for any other wonderful article. The place else may just anybody get that kind of info in such an ideal manner of writing? I’ve a presentation next week, and I am on the look for such information. Hello there. I discovered your blog by means of Google even as searching for a comparable matter, your website got here up. It appears good. I have bookmarked it in my google bookmarks to visit then. Hiya, I am really glad I have found this info. Nowadays bloggers publish just about gossip and web stuff and this is really irritating. A good site with exciting content, that is what I need. Thanks for making this website, and I’ll be visiting again. Do you do newsletters by email? Hi there. I discovered your site by way of Google at the same time as looking for a related matter, your website got here up. It seems good. I’ve bookmarked it in my google bookmarks to come back then. Hi there. I found your site by means of Google while looking for a comparable topic, your site got here up. It seems to be good. I have bookmarked it in my google bookmarks to come back then. I precisely needed to say thanks yet again. I’m not certain the things I would have implemented without the hints provided by you over such a subject matter. It was actually an absolute difficult condition in my circumstances, nevertheless observing your specialized strategy you resolved that took me to cry over joy. I will be grateful for the advice as well as have high hopes you know what an amazing job you are putting in teaching many people all through your websites. I’m certain you have never met all of us. Hey there. I found your site via Google even as searching for a related topic, your website got here up. It appears great. I’ve bookmarked it in my google bookmarks to visit then. Hiya, I am really glad I’ve found this info. Today bloggers publish only about gossip and net stuff and this is actually irritating. A good web site with interesting content, this is what I need. Thanks for making this web-site, and I will be visiting again. Do you do newsletters by email? Hi there. I discovered your website by way of Google at the same time as searching for a similar subject, your site got here up. It looks great. I’ve bookmarked it in my google bookmarks to visit then. Hiya, I am really glad I have found this info. Nowadays bloggers publish just about gossip and net stuff and this is actually annoying. A good web site with exciting content, this is what I need. Thanks for making this web site, and I’ll be visiting again. Do you do newsletters by email? Hello there. I discovered your web site by way of Google while looking for a related matter, your web site got here up. It looks great. I’ve bookmarked it in my google bookmarks to visit then. Fantastic goods from you, man. I’ve understand your stuff previous to and you’re just too great. I really like what you’ve acquired here, really like what you’re saying and the way in which you say it. You make it enjoyable and you still take care of to keep it wise. I cant wait to read far more from you. This is actually a terrific web site. I just want to say I am just newbie to blogging and actually liked this page. Most likely I’m going to bookmark your blog . You amazingly come with exceptional well written articles. Thanks a bunch for sharing your web-site. Hiya, I am really glad I have found this info. Nowadays bloggers publish only about gossip and web stuff and this is really annoying. A good website with interesting content, that’s what I need. Thank you for making this web-site, and I will be visiting again. Do you do newsletters by email? I am now not certain the place you’re getting your information, however good topic. I must spend a while studying much more or understanding more. Thank you for great info I used to be in search of this information for my mission. Hi there. I found your site by means of Google at the same time as looking for a similar subject, your web site got here up. It appears to be great. I have bookmarked it in my google bookmarks to visit then. Hey there. I found your site via Google at the same time as looking for a related subject, your web site got here up. It seems to be great. I’ve bookmarked it in my google bookmarks to visit then. Hiya, I’m really glad I have found this information. Nowadays bloggers publish only about gossip and net stuff and this is really annoying. A good site with exciting content, that is what I need. Thanks for making this web site, and I’ll be visiting again. Do you do newsletters by email? Hiya, I am really glad I have found this information. Today bloggers publish just about gossip and internet stuff and this is actually annoying. A good site with exciting content, that’s what I need. Thanks for making this site, and I will be visiting again. Do you do newsletters by email? What i don’t realize is in reality how you are no longer actually a lot more well-preferred than you may be right now. You are very intelligent. You recognize thus significantly on the subject of this matter, made me individually believe it from numerous numerous angles. Its like women and men are not interested except it¡¦s something to do with Lady gaga! Your individual stuffs nice. At all times take care of it up! I truly wanted to construct a simple note so as to thank you for some of the pleasant instructions you are posting on this site. My considerable internet look up has finally been recognized with useful content to share with my partners. I ‘d claim that many of us readers actually are unquestionably blessed to exist in a decent website with many brilliant individuals with insightful things. I feel really lucky to have used the website page and look forward to plenty of more fun minutes reading here. Thanks once more for a lot of things. Thank you for another wonderful article. Where else may just anyone get that type of info in such an ideal means of writing? I’ve a presentation subsequent week, and I’m at the look for such information. Thanks for your whole labor on this website. My daughter loves managing internet research and it’s really obvious why. Many of us know all regarding the dynamic manner you give good strategies through the web blog and therefore invigorate participation from the others on the area plus our own daughter is without a doubt studying a lot of things. Take pleasure in the remaining portion of the new year. You’re the one performing a wonderful job. Hiya, I’m really glad I’ve found this info. Today bloggers publish just about gossip and internet stuff and this is actually annoying. A good blog with interesting content, this is what I need. Thanks for making this website, and I’ll be visiting again. Do you do newsletters by email? Hey there. I discovered your web site by means of Google at the same time as searching for a related subject, your web site got here up. It looks great. I have bookmarked it in my google bookmarks to come back then. Hello there, I found your website by way of Google while looking for a comparable matter, your website came up, it seems to be great. I have bookmarked it in my google bookmarks. Hiya, I’m really glad I’ve found this information. Nowadays bloggers publish just about gossip and internet stuff and this is really annoying. A good web site with exciting content, that is what I need. Thank you for making this website, and I’ll be visiting again. Do you do newsletters by email? Hiya, I’m really glad I have found this information. Today bloggers publish just about gossip and web stuff and this is actually annoying. A good blog with exciting content, that’s what I need. Thanks for making this website, and I will be visiting again. Do you do newsletters by email? I definitely wanted to construct a word so as to thank you for some of the fantastic guidelines you are sharing on this site. My time consuming internet search has at the end been paid with useful insight to exchange with my friends and classmates. I would repeat that we site visitors actually are very blessed to exist in a fine place with so many brilliant professionals with interesting advice. I feel somewhat blessed to have come across your entire webpages and look forward to many more cool moments reading here. Thanks a lot once more for all the details. Hello there. I found your web site by means of Google whilst looking for a similar subject, your site got here up. It appears great. I have bookmarked it in my google bookmarks to visit then. Hiya, I’m really glad I have found this information. Nowadays bloggers publish only about gossip and web stuff and this is really frustrating. A good web site with exciting content, that’s what I need. Thanks for making this website, and I’ll be visiting again. Do you do newsletters by email? Hello there. I discovered your web site by the use of Google whilst looking for a comparable topic, your web site got here up. It appears good. I have bookmarked it in my google bookmarks to visit then. Hiya, I am really glad I’ve found this info. Nowadays bloggers publish just about gossip and net stuff and this is actually annoying. A good website with interesting content, that’s what I need. Thank you for making this site, and I will be visiting again. Do you do newsletters by email? Hi there. I found your site by way of Google at the same time as searching for a related subject, your website came up. It seems great. I have bookmarked it in my google bookmarks to visit then. Hey there. I discovered your site by means of Google whilst searching for a comparable topic, your web site got here up. It seems great. I have bookmarked it in my google bookmarks to come back then. Hello there. I discovered your website via Google while searching for a comparable topic, your site got here up. It seems to be great. I have bookmarked it in my google bookmarks to come back then. Hi there. I found your blog by way of Google whilst searching for a related topic, your web site got here up. It appears great. I’ve bookmarked it in my google bookmarks to come back then. Hello there. I found your blog by the use of Google at the same time as searching for a similar subject, your website got here up. It looks great. I’ve bookmarked it in my google bookmarks to come back then. Hey there. I discovered your web site by the use of Google while searching for a comparable topic, your site got here up. It looks good. I have bookmarked it in my google bookmarks to come back then. Hiya, I’m really glad I’ve found this info. Today bloggers publish only about gossip and web stuff and this is actually irritating. A good web site with interesting content, that’s what I need. Thanks for making this site, and I will be visiting again. Do you do newsletters by email? I am also writing to make you know of the wonderful encounter my wife’s girl obtained viewing your web page. She came to understand a lot of things, which include what it is like to have a marvelous helping mood to let other folks just learn specified specialized issues. You really exceeded her expectations. Many thanks for churning out such productive, trustworthy, edifying and in addition cool thoughts on the topic to Julie. Hiya, I’m really glad I have found this information. Nowadays bloggers publish only about gossip and web stuff and this is actually frustrating. A good blog with interesting content, that is what I need. Thanks for making this website, and I will be visiting again. Do you do newsletters by email? Hey there. I found your website by way of Google at the same time as looking for a related topic, your site got here up. It appears to be good. I’ve bookmarked it in my google bookmarks to come back then. Hey there. I discovered your website by way of Google while searching for a related subject, your site got here up. It seems great. I have bookmarked it in my google bookmarks to come back then. Hey there. I discovered your web site by means of Google even as searching for a comparable matter, your web site got here up. It seems to be great. I have bookmarked it in my google bookmarks to come back then. Hey there. I found your blog by the use of Google while searching for a similar subject, your web site came up. It looks great. I’ve bookmarked it in my google bookmarks to visit then. Hiya, I am really glad I have found this info. Today bloggers publish only about gossip and net stuff and this is really frustrating. A good site with exciting content, this is what I need. Thanks for making this web-site, and I’ll be visiting again. Do you do newsletters by email? Hello there. I found your web site by way of Google whilst searching for a related matter, your web site came up. It seems to be good. I’ve bookmarked it in my google bookmarks to visit then. Hey there. I discovered your blog by the use of Google whilst looking for a similar subject, your website got here up. It seems to be great. I have bookmarked it in my google bookmarks to visit then. Hello there. I discovered your website by way of Google whilst searching for a comparable subject, your web site got here up. It looks great. I have bookmarked it in my google bookmarks to come back then. Hi there. I found your site by way of Google at the same time as looking for a related subject, your web site came up. It seems great. I’ve bookmarked it in my google bookmarks to come back then. Hey there. I found your web site by means of Google whilst searching for a similar topic, your web site got here up. It appears great. I’ve bookmarked it in my google bookmarks to visit then. Hello there. I found your site via Google while looking for a related topic, your website got here up. It appears to be great. I have bookmarked it in my google bookmarks to come back then. Hiya, I’m really glad I have found this info. Nowadays bloggers publish just about gossip and net stuff and this is really annoying. A good blog with interesting content, this is what I need. Thank you for making this web-site, and I’ll be visiting again. Do you do newsletters by email? Hi there. I found your website by means of Google even as looking for a similar subject, your site got here up. It seems to be great. I’ve bookmarked it in my google bookmarks to come back then. Hey there. I discovered your web site by the use of Google even as searching for a related subject, your website got here up. It seems good. I’ve bookmarked it in my google bookmarks to visit then. Hello there. I discovered your web site via Google even as searching for a similar matter, your web site came up. It appears good. I’ve bookmarked it in my google bookmarks to visit then. Wow, amazing weblog structure! How lengthy have you ever been running a blog for? you made running a blog glance easy. The total glance of your website is fantastic, as well as the content material! Hello there. I found your site via Google even as searching for a related matter, your website came up. It looks great. I have bookmarked it in my google bookmarks to visit then. Hey there. I found your site via Google whilst looking for a comparable subject, your website came up. It seems to be good. I have bookmarked it in my google bookmarks to visit then. Hi there. I discovered your website via Google at the same time as searching for a related subject, your web site came up. It appears to be good. I’ve bookmarked it in my google bookmarks to come back then. Hi there. I discovered your blog by the use of Google while looking for a similar subject, your web site came up. It seems good. I’ve bookmarked it in my google bookmarks to visit then. Hi there. I found your website via Google while searching for a similar topic, your website got here up. It seems to be good. I have bookmarked it in my google bookmarks to come back then. Hey there. I discovered your website via Google even as searching for a related matter, your web site came up. It seems good. I have bookmarked it in my google bookmarks to come back then. Hiya, I’m really glad I’ve found this info. Today bloggers publish just about gossip and web stuff and this is really frustrating. A good web site with interesting content, that’s what I need. Thanks for making this site, and I will be visiting again. Do you do newsletters by email? Hello there. I discovered your blog by way of Google whilst looking for a related topic, your web site got here up. It seems to be good. I have bookmarked it in my google bookmarks to come back then. Hey there. I discovered your website by way of Google while looking for a related subject, your website got here up. It looks great. I have bookmarked it in my google bookmarks to visit then. Hi there. I discovered your site by way of Google while looking for a related topic, your web site came up. It seems great. I have bookmarked it in my google bookmarks to visit then. Hiya, I’m really glad I’ve found this info. Today bloggers publish just about gossip and web stuff and this is actually annoying. A good website with interesting content, this is what I need. Thanks for making this web site, and I will be visiting again. Do you do newsletters by email? Hi there. I found your web site by the use of Google while searching for a similar matter, your web site came up. It looks great. I’ve bookmarked it in my google bookmarks to come back then. Hiya, I am really glad I have found this info. Today bloggers publish only about gossip and internet stuff and this is really frustrating. A good site with interesting content, that’s what I need. Thanks for making this site, and I will be visiting again. Do you do newsletters by email? Hey there. I discovered your site by the use of Google while looking for a comparable subject, your website came up. It looks good. I have bookmarked it in my google bookmarks to visit then. Hi there. I discovered your blog by means of Google even as searching for a related matter, your web site got here up. It seems good. I have bookmarked it in my google bookmarks to come back then. Hey there. I discovered your blog via Google at the same time as searching for a related subject, your website got here up. It appears great. I have bookmarked it in my google bookmarks to come back then. Hey there. I found your website by means of Google while looking for a comparable matter, your website got here up. It looks great. I’ve bookmarked it in my google bookmarks to come back then. Hey there. I discovered your website via Google even as looking for a similar topic, your site came up. It appears to be great. I’ve bookmarked it in my google bookmarks to visit then. great put up, very informative. I ponder why the opposite experts of this sector do not understand this. You must proceed your writing. I am sure, you’ve a great readers’ base already! Hiya, I am really glad I’ve found this information. Nowadays bloggers publish only about gossip and net stuff and this is actually annoying. A good site with interesting content, this is what I need. Thanks for making this site, and I’ll be visiting again. Do you do newsletters by email? I am intending to relocate to Australia permanently. Hopefully, my immigration process will be finished this year and I will relocate the beginning of 2011. Can somebody recommend some exceptional sources and blog sites concerning making the prepare for settling in Australia?. Hey there. I found your website by means of Google while searching for a related subject, your website got here up. It appears good. I’ve bookmarked it in my google bookmarks to visit then. Hey there. I discovered your site via Google even as searching for a comparable subject, your website came up. It seems great. I have bookmarked it in my google bookmarks to visit then. Hiya, I’m really glad I have found this information. Today bloggers publish only about gossip and net stuff and this is actually irritating. A good site with interesting content, that is what I need. Thanks for making this site, and I’ll be visiting again. Do you do newsletters by email? Hello there. I found your web site by means of Google whilst looking for a comparable subject, your website came up. It appears to be great. I have bookmarked it in my google bookmarks to come back then. Hiya, I’m really glad I’ve found this info. Today bloggers publish just about gossip and net stuff and this is actually irritating. A good site with interesting content, this is what I need. Thank you for making this website, and I will be visiting again. Do you do newsletters by email? Hello there. I discovered your website by way of Google even as searching for a related topic, your web site came up. It seems to be great. I’ve bookmarked it in my google bookmarks to come back then. Hey there. I found your web site by means of Google at the same time as looking for a comparable subject, your website got here up. It looks great. I’ve bookmarked it in my google bookmarks to come back then. Hiya, I’m really glad I’ve found this info. Nowadays bloggers publish just about gossip and internet stuff and this is actually irritating. A good web site with exciting content, this is what I need. Thanks for making this web site, and I will be visiting again. Do you do newsletters by email? Hey there. I discovered your website via Google at the same time as looking for a similar topic, your web site came up. It looks good. I have bookmarked it in my google bookmarks to come back then. Hey there. I discovered your web site via Google even as searching for a related topic, your web site got here up. It looks great. I have bookmarked it in my google bookmarks to visit then. Hi there. I found your site by the use of Google even as searching for a related subject, your website came up. It looks great. I’ve bookmarked it in my google bookmarks to come back then. Hiya, I am really glad I’ve found this information. Today bloggers publish just about gossip and internet stuff and this is actually frustrating. A good blog with interesting content, that is what I need. Thank you for making this site, and I’ll be visiting again. Do you do newsletters by email? Hiya, I am really glad I’ve found this information. Nowadays bloggers publish just about gossip and internet stuff and this is really irritating. A good blog with exciting content, that’s what I need. Thanks for making this web site, and I will be visiting again. Do you do newsletters by email? Hey there. I found your site via Google while searching for a related matter, your website got here up. It looks good. I’ve bookmarked it in my google bookmarks to visit then. Hello there. I found your web site by way of Google even as searching for a related matter, your web site came up. It looks great. I’ve bookmarked it in my google bookmarks to come back then. Hiya, I’m really glad I’ve found this information. Nowadays bloggers publish just about gossip and web stuff and this is actually frustrating. A good web site with interesting content, that’s what I need. Thank you for making this website, and I will be visiting again. Do you do newsletters by email? Hi there. I found your site via Google whilst searching for a related matter, your site got here up. It looks good. I have bookmarked it in my google bookmarks to come back then. Thank you a lot for giving everyone such a remarkable opportunity to read from this website. It’s usually so fantastic and as well , full of a good time for me personally and my office friends to visit your website not less than three times in 7 days to find out the fresh secrets you have. Of course, we’re certainly astounded with all the mind-boggling guidelines served by you. Some two ideas in this article are ultimately the simplest we’ve had. Hiya, I’m really glad I have found this info. Today bloggers publish just about gossip and net stuff and this is really annoying. A good blog with exciting content, that’s what I need. Thank you for making this website, and I will be visiting again. Do you do newsletters by email? Hiya, I am really glad I have found this information. Today bloggers publish just about gossip and internet stuff and this is really irritating. A good blog with exciting content, that’s what I need. Thanks for making this web-site, and I’ll be visiting again. Do you do newsletters by email? Hi there. I discovered your blog by the use of Google even as searching for a similar topic, your site got here up. It appears to be good. I have bookmarked it in my google bookmarks to visit then. I was just searching for this info for some time. After 6 hours of continuous Googleing, at last I got it in your web site. I wonder what’s the lack of Google strategy that don’t rank this type of informative sites in top of the list. Usually the top websites are full of garbage.